We start to move towards a traditional schedule with more night games across baseball for Week 4. There are still some teams that will receive the benefit of added off days, but we have plenty of two-start pitchers who could leave significant impacts in fantasy. Let’s highlight a handful of options to see whether you should start or avoid them based on their matchups. It doesn’t get much juicier than this. Injuries have been a problem for Strasburg throughout his career, but he’s healthy right now and already has 20 strikeouts across 16.2 innings. That should come as no surprise considering his career 29 percent strikeout rate. Even though he’s given up his fair share of runs through his first three outings, this is a prime opportunity for him to shine. The Giants only have a .591 OPS out of the gate and the Marlins aren’t much better with their .617 OPS. Neither has an imposing lineup by any stretch of the imagination, so start Strasburg with confidence. Castillo made the jump from Double-A straight to the majors in 2017 and showed plenty of promise with his 3.41 xFIP, 1.08 WHIP and 27.3 percent strikeout rate. Big things were expected of him in 2018, but he failed to live up to the hype with a 4.30 ERA. He had troubles keeping hitters inside the ballpark by allowing 1.5 HR/9 and his strikeout rate dropped to 23.3 percent. Some of that decline could have been due to a decrease in velocity with his average fastball declining from 97.7 mph in 2017 to 96.4 mph in 2018. On a positive note, his 3.69 xFIP indicated he didn’t pitch all that poorly. He’s looked like he did in 2017 through his first three starts this year, recording 25 strikeouts and allowing just two runs across 19.2 innings. Just as important is the fact that he hasn’t allowed a home run. 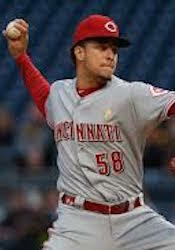 Even though he had a couple of creampuff matchups against the Pirates and Marlins, he did have to face the Brewers. His first start of Week 4 will bring a tough test on the road against the Dodgers. However, his second start isn’t all that intimidating against a Padres team that only has a .309 OBP out of the gate. While you might need to temper your expectations due to his matchup with the Dodgers, he’s still worthy of being in fantasy starting lineups. As disappointing as Chris Sale has been, Boyd has been one of the most pleasant surprises in the league. Normally not a great source for strikeouts, he already has 29 punch outs over 17.1 innings. He also hasn’t given up a home run, which is huge considering he allowed 1.4 HR/9 last year. Even if he is poised for a better season, there is no way he’s going to keep up his current 40.3 percent strikeout rate. With that being said, this doesn’t have to be the week in which regression hits. The Pirates are tied for the second-fewest home runs (eight) in the league while the White Sox are also in the bottom third of the league in that category with 12 long balls. Boyd also gets the benefit of starting both games at home, where he allowed a .263 wOBA last year compared to his .338 wOBA allowed on the road. Pivetta’s 4.77 ERA and 1.31 WHIP last year don’t look great, but a deeper dive indicates he didn’t pitch that poorly. He had a 3.42 xFIP and was a bit unlucky with a .326 BABIP allowed. He also made significant strides in the strikeout department with a 27.1 percent punch out rate. There was plenty of debate surrounding his prospects for this season and he’s off to an atrocious start by allowing 15 runs (14 earned) over 13.1 innings. Things won’t get any easier for him in his first start of Week 4 against a much improved Mets lineup. To make matters worse, his second start is against the Rockies in Coors Field. Better days might be ahead for Pivetta, but make sure he’s anchored to your bench this week. Darvish’s stint with the Cubs has been nothing short of a disaster. Injuries limited him to just 40 innings last year and he wasn’t effective when he was on the mound with a 4.24 xFIP and 1.43 WHIP. However, he still managed to record a 27.2 percent strikeout rate. His ability to rack up strikeouts in bunches had some people still seeking him out on draft day. Unfortunately for those who selected him, he hasn’t been able to find the plate in his first two starts, issuing 11 walks over 12 innings. Just as concerning is the fact that he only has 10 strikeouts. His first start this week is a favorable matchup against the Marlins, but the Diamondbacks can do some damage. Despite losing Paul Goldschmidt, David Peralta and company have the fourth-highest OPS (.824) in the league. Until Darvish shows signs of regaining his control, he’s just too risky in my eyes. If he tanks in both starts, he could really put fantasy owners behind the eight ball. Mike Barner has been covering fantasy sports since 2007. His work has appeared in Sports Illustrated, Yahoo, SportsLine and RotoWire. Mike was also a finalist for the 2018 FSWA Basketball Writer of the Year award. Follow Mike on Twitter @rotomikebarner.